Providing quality flooring at affordable rates in Sacramento, North Highlands, Vacaville, and surrounding areas for over 20 years. We offer a variety of carpet and vinyl options for your home or office space. We do the installation at an affordable rate, and we promise you&apos;ll love the look and feel of your flooring! We&apos;ve also recently started offering Move out and residential house cleaning services. Check out a full list of services here. 10% off for new customers! Click here for more details. and knowledgeable in helping me select a carpet. Couldn't be more satisfied. Very friendly and accommodating. Love my new laminate flooring and carpet. They did quality work. Even cut into my fireplace to make it look seemless. They take pride in their work and it shows. 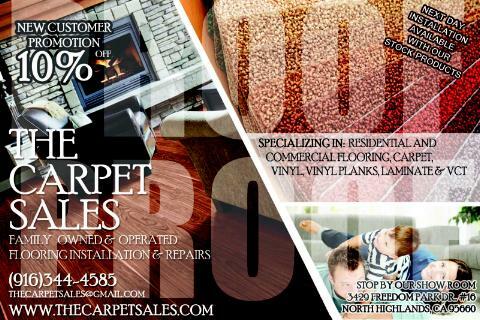 With over 20 years of flooring experience The Carpet Sales is your local expert. We are a proud family owned and operated business who is dedicated to providing quality service to our customers. Read more about us here.